Phytoplankton in this sample from Monterey Bay include both toxin-producing diatoms (needle-shaped cells) and harmless "red tide" algae (orange cells). Photo by Susan Coale. Researchers have detected large blooms of toxin-producing algae in Monterey Bay that appear to be poisoning marine mammals and seabirds. Blooms of the algae, which produce a neurotoxin called domoic acid, first appeared in southern California earlier this spring and are now occurring along the Central Coast. Researchers throughout the Monterey Bay region have been monitoring the situation closely and have detected high levels of the toxin in the bay. Meanwhile, large numbers of dead seabirds, as well as sea lions with symptoms of domoic acid poisoning, have been turning up on Monterey Bay beaches. The link between seabird deaths and domoic acid poisoning is difficult to make, however, and researchers are still analyzing data and waiting for definitive test results. "The impact on marine life depends on how much of the toxin gets into the food web, but in terms of toxin production and the size of the bloom this event is similar to the large blooms we saw in Monterey Bay in 2000 and 2002," said Raphael Kudela, associate professor of ocean sciences at the University of California, Santa Cruz. At the same time, harmless blooms of "red tide" algae have turned the water a reddish-brown color in parts of Monterey Bay. 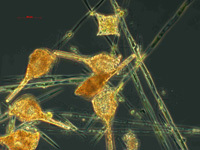 These organisms, a type of dinoflagellate in the genus Ceratium, do not produce toxins. Domoic acid is produced by diatoms (a type of single-celled algae) in the genus Pseudo-nitzschia. A potent neurotoxin, domoic acid accumulates in shellfish and fish that feed on the algae, such as anchovies and sardines. In humans, consumption of seafood contaminated with the toxin causes amnesic shellfish poisoning. Consumers are protected by quarantines on sport-harvested shellfish and state monitoring programs that keep contaminated seafood off the market. But seabirds and marine mammals can suffer massive die-offs during this kind of harmful algal bloom. In southern California, hundreds of seabirds and marine mammals have died from domoic acid poisoning this spring. The domoic acid levels there have been much higher than those detected so far in Monterey Bay--a mussel from Santa Barbara had the highest domoic acid level ever detected. Large numbers of marine animals have been affected, including dolphins and other cetaceans. Several collaborative projects funded by the National Oceanic and Atmospheric Administration (NOAA) are helping to coordinate the efforts of researchers who are tracking the situation along the Central Coast. The Center for Integrated Marine Technologies (CIMT), led by UC Santa Cruz researchers, has been conducting regular surveys of marine life and oceanographic conditions in Monterey Bay for the past five years. UCSC researchers are also working with the California Department of Health Services on a NOAA-funded statewide monitoring program called the California Program for Regional Enhanced Monitoring for PhycoToxins (CalPReEMPT). CIMT and CalPReEMPT researchers intensified their monitoring efforts this spring in response to the developing harmful algal bloom, using a combination of satellite imaging, analysis of water samples and tissue samples from mussels, and surveys of marine life throughout the bay and on the beaches. CalPReEMPT researchers reported large numbers of Pseudo-nitzschia cells and high toxin levels at the Santa Cruz wharf on May 2, but reduced levels a week later. Results from a bay-wide CIMT survey on May 8 and 9 showed the highest domoic acid levels in the middle of Monterey Bay, with high values to the north and no detectable toxin in the south bay. "It's not a single, uniform event--the blooms are spotty, both in time and in locations throughout the bay," said Mary Silver, professor of ocean sciences at UCSC. "When you look at satellite images, the blooms are almost like weather systems or cloud formations--they come and go on a day-to-day basis. But the animals are being affected." James Harvey, a CIMT collaborator at Moss Landing Marine Laboratories (MLML), said California sea lions are the marine mammal species most affected by domoic acid, because they are plentiful along the coast and feed heavily on anchovies and other fish that accumulate the toxin. He said the current harmful algal blooms may end up killing hundreds of California sea lions, but the increased mortality will not have a significant impact on their population, which is currently around 160,000 to 180,000. "It's hard to assess the numbers, because all we see are the ones that wash up on the beach. For southern California, the numbers on the beach are definitely elevated this year," Harvey said. "The numbers locally are not that unusual, but we have seen sea lions with symptoms of domoic acid poisoning." The Marine Mammal Center in Marin County has been seeing sea lions from the Monterey Bay area with acute domoic acid poisoning since the end of March, including five admitted since the beginning of May, said staff veterinarian Felicia Nutter. Several animals have also had seizures and died on the beach before they could be transported to the center, she said. Melissa Miller, a veterinary pathologist at the California Department of Fish and Game's Marine Wildlife Veterinary Care and Research Center, reported that dead sea otters found in the Santa Cruz area this spring showed signs supportive of domoic acid poisoning. Two dead whales also washed up on area beaches this spring, but their deaths were probably unrelated to domoic acid, said Donald Croll, associate professor of ecology and evolutionary biology at UCSC. "This is the time of year when the females and calves are moving north to their feeding grounds, and there is typically some mortality along the way," he said. CIMT coordinates with the monitoring programs of the Monterey Bay National Marine Sanctuary, such as Beach COMBERS, a sanctuary and MLML volunteer program that conducts regular surveys for marine birds and mammals on the beaches. Although the numbers of dead birds on the beaches are higher than normal this spring, it is not yet clear whether domoic acid poisoning is responsible. The Beach COMBERS reported a large die-off of common murres in Monterey Bay in February and March that appeared to be the result of poor prey availability. According to Croll, CIMT surveys show that the recent increase in birds found on the beaches is not due to an unusually large number of birds in the bay. But determining the cause of the bird deaths is not easy. Necropsies (postmortem exams) of dead seabirds have so far not shown typical signs of domoic acid poisoning, according to Elizabeth Phillips of the Department of Fish and Game's Marine Wildlife Veterinary Care and Research Center. Tissue samples are being tested for domoic acid, but researchers are still waiting for those results. Some of the dead birds have appeared emaciated and may have starved to death, Phillips said. "There are a lot of factors at play in the seabird mortalities we've seen lately, and it is difficult to determine whether the increased mortality is related to a domoic acid event or a combination of mortality factors," she said. CIMT surveys indicate that krill, the small crustaceans that are a favorite food for many seabirds, are currently abundant in Monterey Bay, Croll said. But the krill may be contaminated with domoic acid. Upwelling of cold, nutrient-rich water along the coast, driven by winds that push the warm surface layer offshore, determines the productivity of the Monterey Bay ecosystem. The influx of nutrients sparks blooms of algae, which feed krill and small fish that are, in turn, prey for larger fish, seabirds, and marine mammals. Why the algal blooms are dominated by toxin-producing algae in some years is one of the questions researchers are trying to answer. This is a natural phenomenon, however, and will subside as conditions change in the bay. CIMT, CalPReEMT, and the Department of Fish and Game are all part of a broader regional program, the Central and Northern California Ocean Observing System (CeNCOOS), which coordinates ocean observing activities in northern and central California for improved understanding and management of ocean ecosystems.